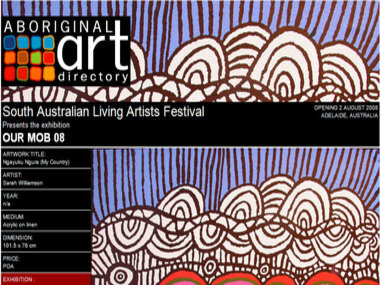 A statewide celebration of regional and remote South Australian Aboriginal artists. Our Mob 08 demonstrates the diversity and vitality of South Australian Aboriginal art. Now in its third year as part of the South Australian Living Artists Festival over 100 artists from around the State are sharing their stories and showing the energy and spirit of contemporary Aboriginal traditions in painting, print, sculpture and carving. Our Mob 08 is held alongside Our Young Mob in the Festival Theatre foyer, an exhibition by South Australia's young Indigenous artists. Artworks are also available for sale through this exhibition. This exhibition is a free event and is currently showing until Sunday 7th September 2008.